“Abide in Me and I in you” (John 15:4). “I am the vine; you are the branches. He who abides in Me, and I in him, bears much fruit; for without Me you can do nothing” (John 15:7). 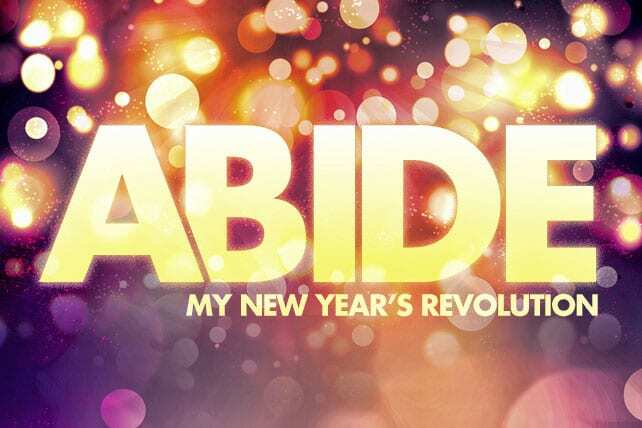 The word the Lord has given me for the year 2016 is “abide.” Or, to say it another way, I feel “called” to abide in Him this year as never before. Our title, “New Year’s Revolution,” is a little play on words. The hymn “I Am Resolved” could be made to read: I am revolved no longer to linger, charmed by the world’s delight. Things that are higher, things that are nobler, these have allured my sight. Revolving implies turning around, and that’s what I am doing. Turning around implies repentance, and I’m doing that also. Think of it as a mid-course correction, the kind you and I are always making. Our Lord said, “Every branch that bears fruit, He prunes that it may bear more fruit” (John 15:2). So, think of this as a pruning, a further refining as I try to bring all of Joe under the Lordship of Jesus Christ. I resolve no longer to abide in my flesh but in Him; no longer to have everyone else’s words filling my mind, but His; no longer to spread my attention out over days and months but to abide in the moment. Abide. A verb, for which “abode” is the noun. We abide in an abode (therefore, we could say Christ will be my Abode). “Abide” means something enduring, lasting, persisting, steadfast and constant. If I visit a place for a while and then leave, I am not abiding but am a visitor. If I take a temporary lease on a dwelling with an expiration date, I do not abide there but am a renter. If I abide in Christ, I stay. I have come to settle down here and never leave. My plans have no expiration date, no “sell by” date. I am here for the duration.